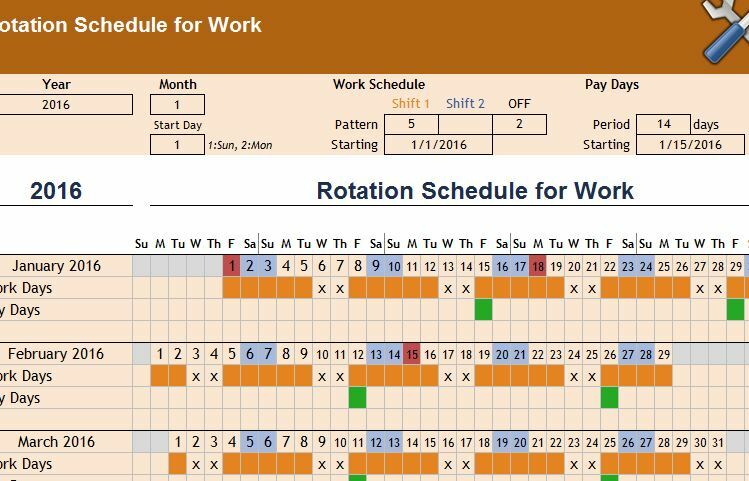 The Rotation Schedule Template is the perfect companion for business owners or employees that have shifting schedules. The template lays out the entire year’s schedule and gives you a way to track all of the changes to a work schedule in a way that flows perfectly and makes sense to anyone. Whether you need to adjust your own work schedule or keep everything fair by implementing an even rotation pattern among all your employees, this template has all the tools you need to do so. You can find out more about this versatile Rotation Schedule by reading the information below. You will start editing this Rotation Schedule by entering the current year, month, and day in the top column. You can also select rotating shift pattern (alternating shifts every certain number of days) and the period of days you want to spend using that same pattern. You may also enter the pay days into this rotation in the indicated area above. You will see this displayed on the main table as a green cell. The next step is to apply this schedule to your employees or write them down for your own work schedule. You will see in the main table that the days of the week are listed on the header of the first row and the days of the month are given below that. The days of your rotation for working, days off, and pay days will all be displayed on the main table. You will also be able to enter holidays or special days in the “Holidays” tab. Here, you can enter days that will be excluded from the rotations. You can take the rotations you create in this template and apply them to your business or work with ease. Try this free template today.